Here at Chetnanigans, our customer’s voice is the clearest, loudest and most important! 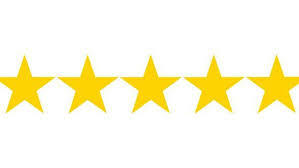 We have 800+ five star reviews, and many with customer’s personalized comments! We encourage you to browse these comments and reviews to see what previous Chetnanigans customers have said about our shop and service. Below are a sampling of our customers responses… If you’d like to see more, jump over to our Etsy Shop and see what others are saying about Chetnanigans and our products! On that site, we receive one 5 Star review about every 36 hours. Finally, we are hopeful that you too will become a delighted customer and add to our list of reviews! Really high quality product that I’m thrilled to own. Great communication from the maker too – thank you very much. It’s perfect and I will enjoy using it. Perfect for almost all of my Clover Amour hooks. My 15mm hook doesn’t fit but no big deal because I rarely use that one. Used the extra spot for my wet erase marker that I use to mark off rows on my patterns that I keep in sheet protectors. 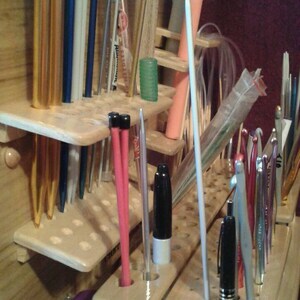 Added a third needle holder instead of a seam ripper holder. Thank you so much for my hook organiser 🙂 it is perfect and holds both clover soft touch and knitpro hooks. I love the craftsmanship of this item! 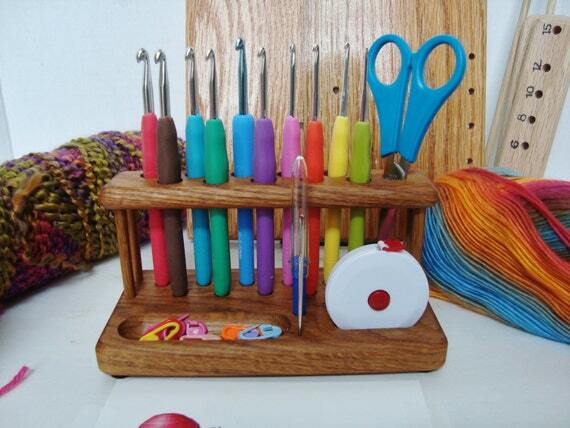 My Amour crochet hook set looks great in it. I love that I can display my hooks in an organized way that is practical. Thank you! Great gift for my Aunty! I have one and love it! Where as this been all of my crocheting years. Love it! It was such a pleasure working with Sean! He was incredibly quick to respond to messages. He asked the right questions to ensure that my custom crochet hook holder exactly met my needs! He delivered within all time frames he provided (for example, he said he’d have a drawing to me by Saturday afternoon and he sent it that morning). My holder came beautifully packaged to ensure safety during transport and included a pair of scissors, a package of stitch markers, a tape measure, a yarn needle and a stitch ripper. It exactly works with my hook collection, is beautifully hand crafted and will be treasured for a long time to come! 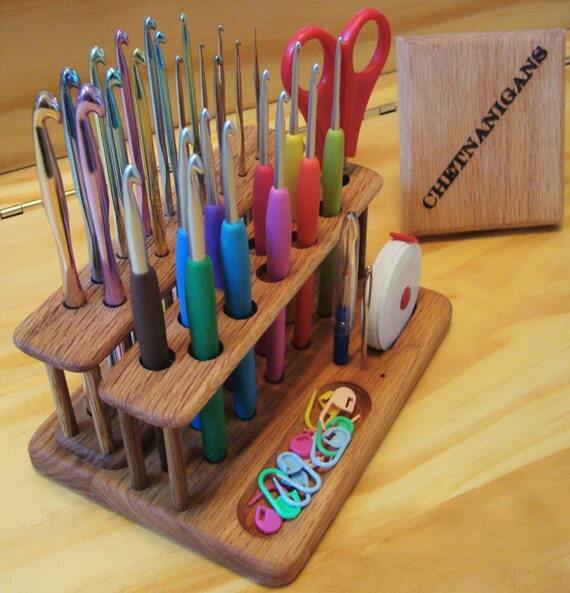 This organizer is wonderful and holds all of my luxury hooks beautifully. I received it timely and the owners were a joy to work with giving me quick responses to all of my questions! I love this! It holds all my hooks and more! Well-made and shipped sooner than promised. This would make a great Christmas present for a crocheter! 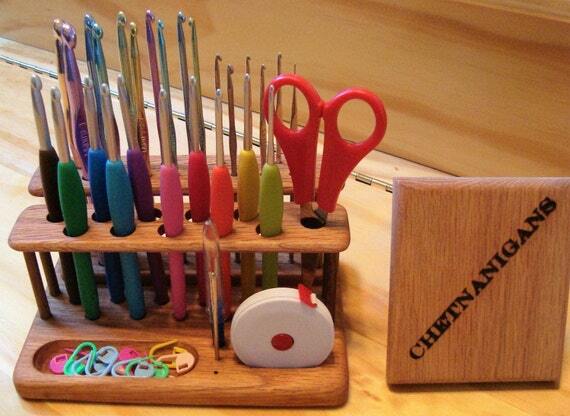 The “Criss-Cross” 8″ EZ Blocker in Red Oak – New From Chetnanigans! have been waiting for this to come and I am so excited that it came earlier than expected. The craftsmanship is world class and looks very professional. I am extremely happy with my purchase and will be looking for more items in the future. Hello Sean and Holly ! Your wonderful package arrived in excellent time and condition. 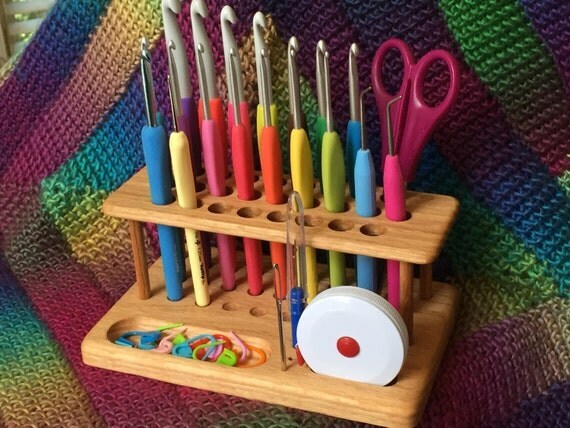 This crochet stand is so beautifully made and is such a perfect tool for orderly storing so many hooks and yet it doesn’t take up much room itself ! It’s the perfect storage solution I was looking for ! A great purchase from a great seller. Great service ! I also thank you for so kindly up-grading my purchase. Thank you very much and all the best ! I love this thing. I fit everything I wanted to on it and there’s still room for more. 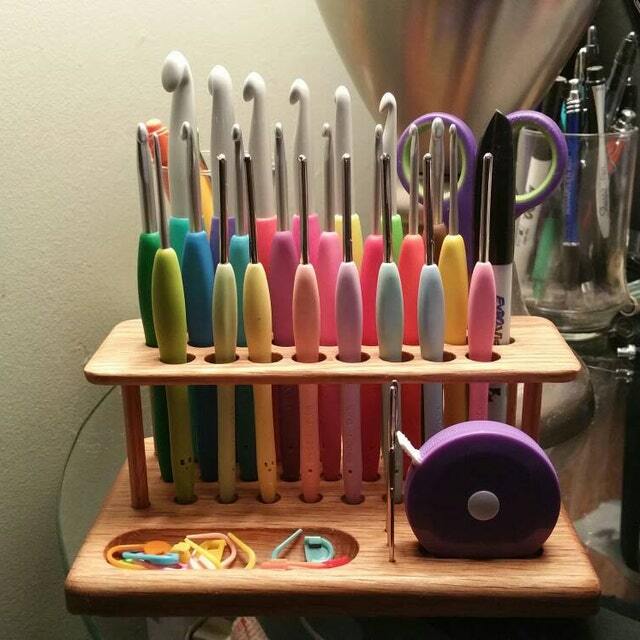 I highly recommend this to anyone who is tired of looking in various crochet hook holders, especially if you have to change hooks often in a project. It’s nice having my scissors and needles readily available, too! 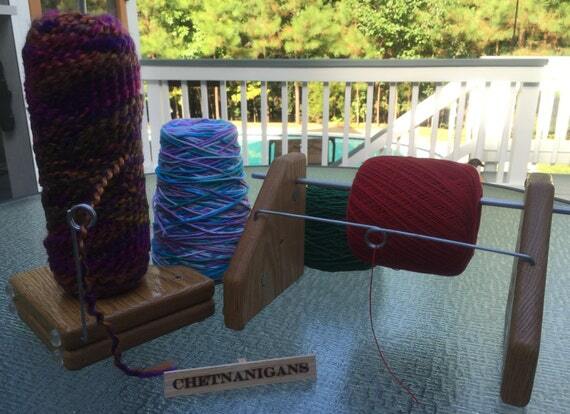 The Pattern Partner – NEW From Chetnanigans! Fast shipping, super packing to protect my Pattern Partner, and the Pattern Partner itself is a thing of beauty! Excellent craftsmanship-you won’t find better quality anywhere. Like all of my other purchases from Chetnanigans, this will be a joy to use for many years. All my items from Sean and Holly have become an essential part of my crafting world-I wouldn’t think of doing without them-thanks so very much! 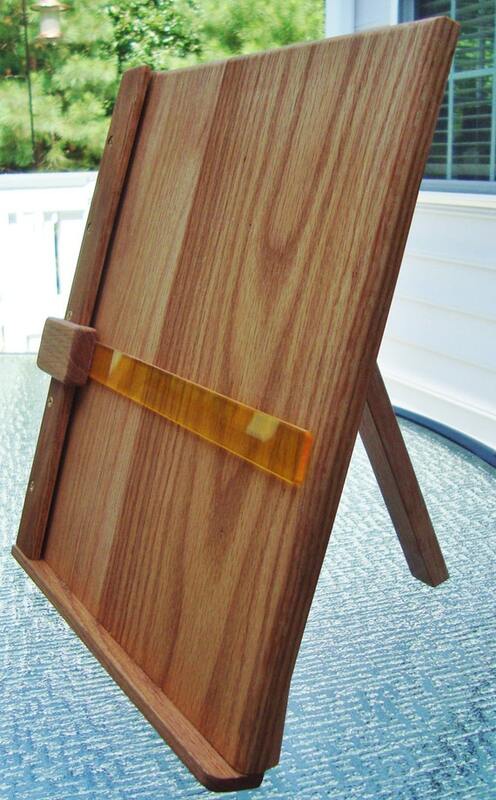 The 12″ Adjustable BlocksAll Plus Blocking Board – New From Chetnanigans! Wonderful help! I just used My BlocksAll Plus for the first time and I have to say that this is an amazing tool! And the owners are awesome people too! Thanks so much! I thought I had enough to fill it, but it can hold more! LOVE THIS .. this is my second one and I love its versatility. Thanks Sean for the ‘double’ wire set too!! You folks are AWESOME!! Absolutely love my custom hook holder. It’s beautiful AND functional and I couldn’t be happier with it. Thank you, Chetnanigans, for everything you did for me including create this gorgeous piece of functional art!!!!!! 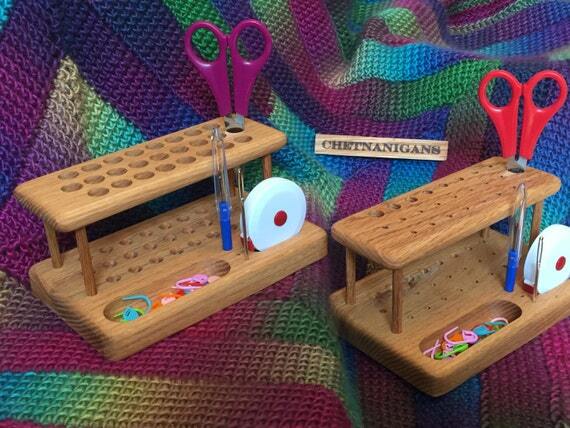 The SlimLine Comfort Grip Deluxe Organizer / Workstation – New From Chetnanigans! Beautiful mom sent me the picture tonight after picking it up. Can’t wait until Christmas! 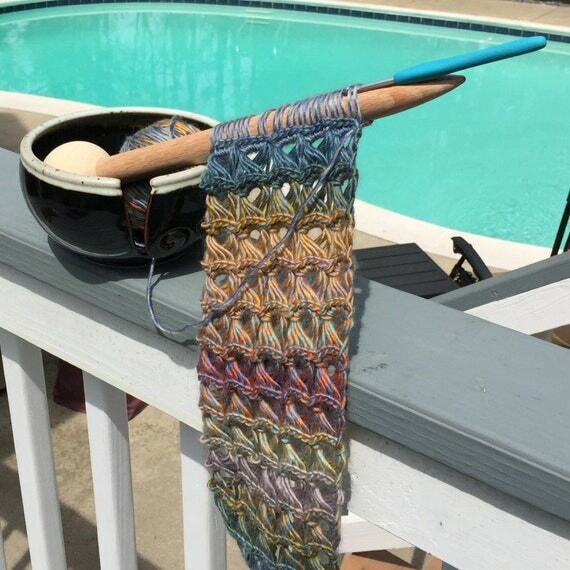 Love this, with the groove it makes it so much faster when you do broomstick lace. Also, construction is very nice. Unique item love this tool ! 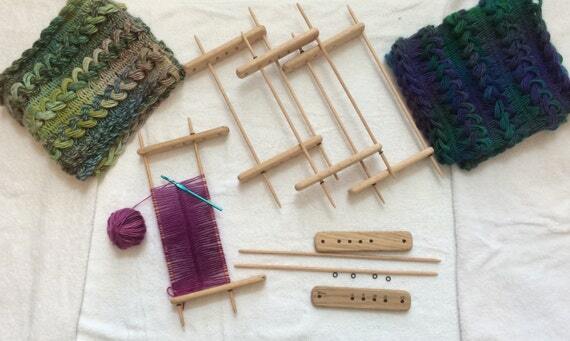 Perfectly crafted shipped fast and safely keep thinking of these innovative fiber arts products ! Love this tool . This is absolutely perfect! 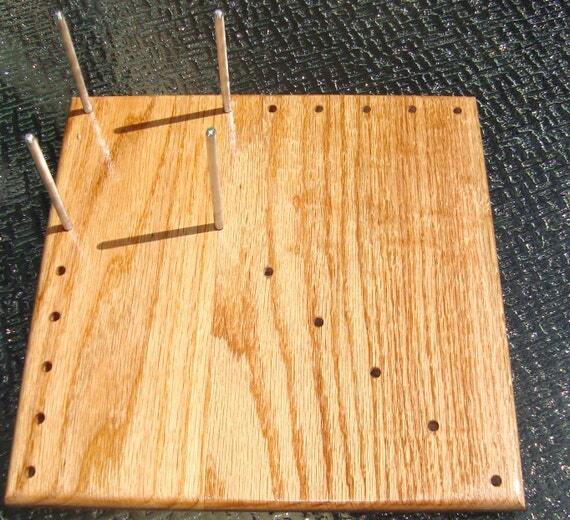 I have been wanting a wooden blocker for some time and could not find one here in the States. Then, I was ‘poking’ around on Etsy one day and thought about doing a search….and this wonderful board is the result of that search! It is beautifully made and the back is finished so that it will not scratch anything! Thank you so much, I am looking forward to using this for years to come…. I am going to keep my eyes on this shop! I crochet in living room. 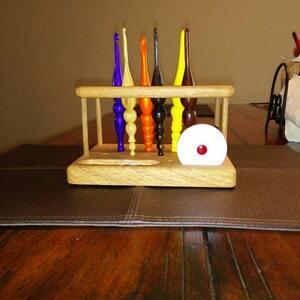 This makes it convenient and looks good on my end table too!! It is very well crafted. Sturdy with no rough edges. Thinking of another one for my craft room. I received an elite hook organizer for a gift, but I was a little sad that all of my clover amour hooks (I have a lot of them) and my 15mm clover hook would not fit in it. I was able to get in touch with Sean and send my new, unused unit back to him so he could create a custom elite for me for a small customization free + shipping. I really appreciate that he was able to be flexible for me! My new unit is perfect and I love seeing all of my hooks lined up in it. Not to mention, it’s also very beautiful and very sturdy! Sean and Holly were a pleasure to work with, I wholeheartedly recommend them! Thank you! My blocking board just arrived and it’s perfect. It’s everything I hoped for. 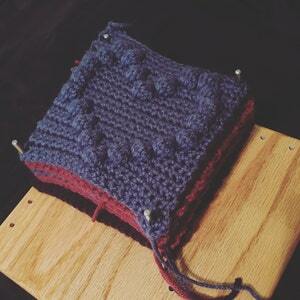 I have a stack of afghan squares to block and I can’t wait. Thank you so much. These are perfect !!!!! Fast delivery !!!!! Thanks so much for sharing your talent !!!!!! Love my organizer. It was custom made for my needs and I couldn’t be more pleased! It’s so nice to have my crochet area nice and neat with everything at my fingertips. It’s an awesome piece that will be passed down to my daughter, then my granddaughter. OMG & WOW !!!!!! This is just AWESOME !!!!!!! I am sooooo impressed with this shop and the stuff they make !!!!!!!!!!!! Fast delivery !!!!!! Thanks so much for sharing your talent !!!!!!!!!!!!!!!! Love my new stand. Perfect organization while I’m hooking. Quality and workmanship just beautiful. I love the goodies you sent with it too. No more excuses for my hooks all over the place. I love the blocking board. Perfect. Just what I wanted. Very nice craftsmanship! My sister in law will love it! Can’t wait to give it to her! Great quality and customer service — I will be a repeat customer! great workmanship. It will get much use. Repeat customer, just love my hook stands! Great quality — will purchase again! Customer service was impeccable. It is perfect! It was a mother’s day gift for my mother and she loves it! Just received my crochet workstation and it is gorgeous! You can see the high quality craftsmanship throughout. I will treasure and enjoy using this lovely, functional piece and bonus items. Everything I need will be within reach. Thank you so much! Absolutely couldn’t work with better folks. They bend over backwards to be sure you get exactly what you want. I have been and will be a return customer. 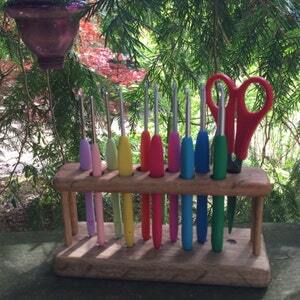 High quality workmanship, super fast shipping – Perfect for my ergonomic crochet hooks and the stitch markers, scissors and tape measure match the excellent quality of the organizer. My favorite Etsy purchase ever! 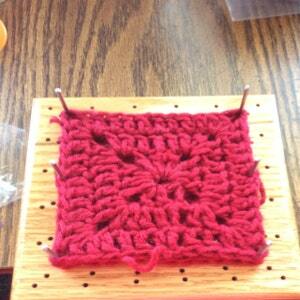 Making square after square – this sure comes in handy! Great workmanship and very quick to ship! This is super cool. I can’t wait to make a blanket. Great craftsmanship and owners couldn’t be any more customer oriented. Love my entire experience from start to finish and will be back! This is going to see a lot of use. I love that it can be used vertical or horizontal. Great concept! Another beautiful piece. The rods are lightweight and easy to hold. 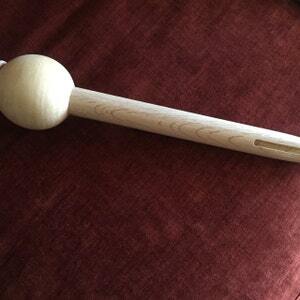 The “Groove” Broomstick Lace Pin / Tool – New From Chetnanigans! This is an amazing tool! Beautiful and has some heft to it which I love. The groove is great, too! Stunning! Heirloom quality for sure. Such a pleasure to work with. Will definitely be ordering more in the future. Gorgeous! Exceptional customer service. Everything well packaged for shipping. Love this shop! Can’t wait to give it to my mom for Christmas. Cool and neat organization station for the hooks. 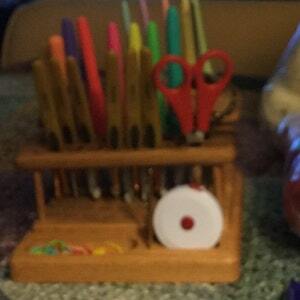 Beautifully crafted and works perfectly in my sewing room! I love how easy this is to use!! Awesome customer service and quality workmanship! Metal peg so they don’t warp or shift! I had ordered this item as a gift for my mother. She absolutely loved it! It was beautiful, and I was very surprised at all the wonderful accessories included with the purchase. Thank you! 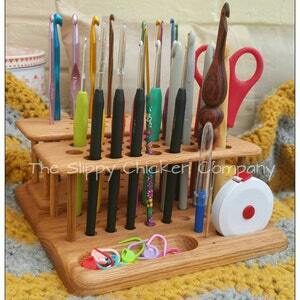 I ordered on Saturday and the SlimLine Elite Crochet Hook Organizer arrived Wednesday morning. Perfect! I hadn’t realized how many duplicate hooks I owned. 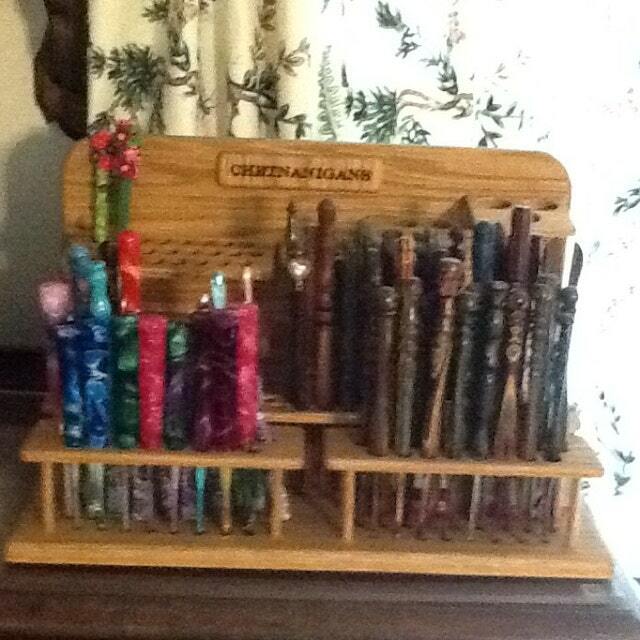 Now my hooks are organized and at the ready. Quality workmanship and speedy service. Package was very nice, the item was securely wrapped in bubble warp. I would definitely recommend this shop and this product. Thank you so much! OMG & WOW !!!!!! It turned out GREAT and I am just THRILLED with it !!!!!! Thanks so much Sean for everything !!!!! I LOVE IT !!!!!! 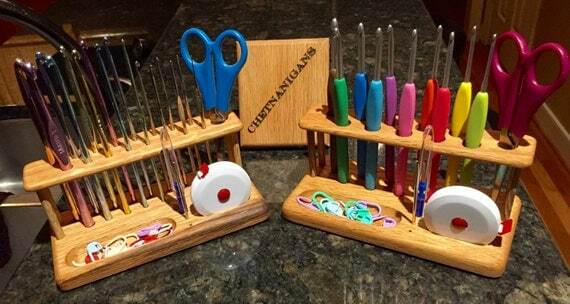 The SlimLine Standard Grip Deluxe Organizer / Workstation – New From Chetnanigans! A fine bit of craftsmanship! Package extremely well, and shipped earlier than expected! 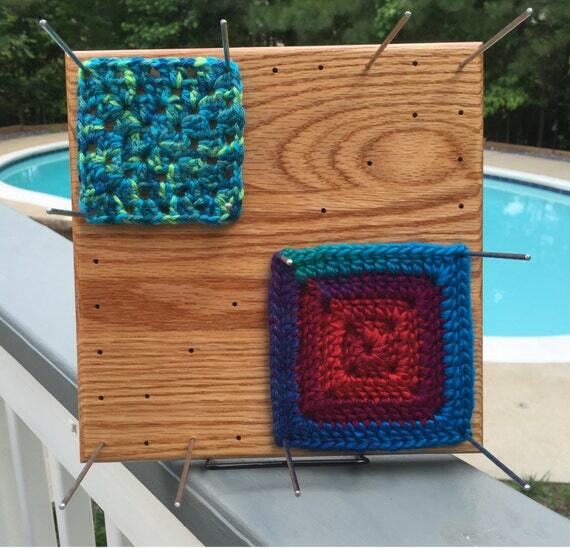 Perfect for all my crochet squares AND even can use it for any odd shaped motifs too! Very pleased and will shop here again! Thank you!! 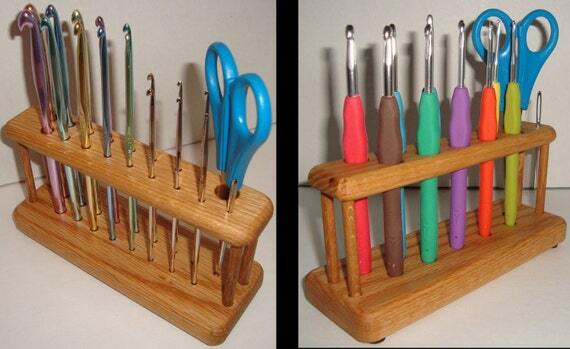 This is perfect for all the different size crochet hooks I have! Excellent piece of craftsmanship! Was packaged with care. And shipped early! Very nice place to buy from. This buying experience was a total pleasure! I highly recommend this merchant! This was a gift and it went over very well. Recipient is thrilled with the packaging and the product. It shipped quickly and safely and the seller was great. 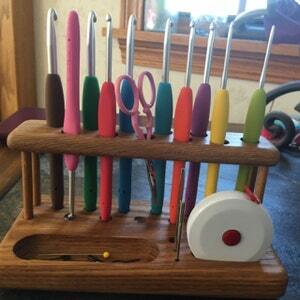 This is so great, it fits all my furl crochet hooks perfect. I just love it! Thank You! Love my blocking board. Quality workmanship and materials. Everything I have ordered from this shop is top quality. Will be back. Thank you. I’ve been collecting hand turned hooks for years but never had a proper place to display them. Then I found Chetnanigans! Sean is amazing! He listened to exactly what I wanted and worked hard to make sure I was completely satisfied. I love my organizers and I will definitely be back to buy more of his beautiful creations. Thank you Sean!! Perfect for holding my bamboo handled Suzie B hooks. Your attention to detail makes your products my treasured possessions!! 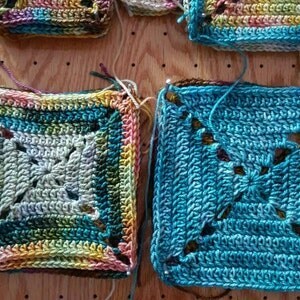 The blocker is beautiful .. and handy helper in laying out block color patterns. EXCELLENT CRAFTSMANSHIP!! After my order, it was delivered very quickly. Arrived in time for my wife’s birthday. It was perfect and she loved it!!!!! What a wonderful little workstation! Workmanship and quality of this item is first class, I am absolutely thrilled with my purchase, well done Chetnanigans! 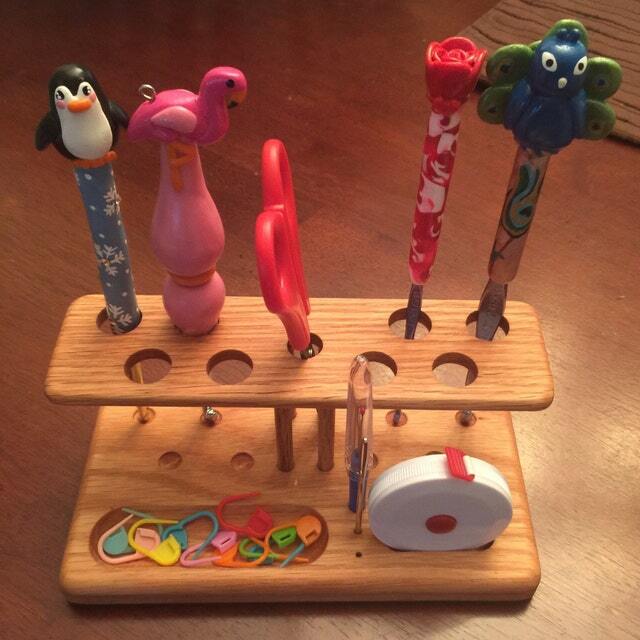 Even though my 2-year old has decided this is for her crayons, I get to use it on occasion for my hooks! I received it today and I just love it just what I needed thank you! LOVE. LOVE. LOVE. This is PERFECT! I love how organized it Keeps my hooks and it looks nice just sitting out also! I turn the hook that I am currently using upside down to avoid mix ups! I don’t loose my needles or tape measure now! And my markers….gasp….are easily reachable!! Thank you! Received it ahead of schedule, great workmanship, thank you for putting the vision in my head to wood! 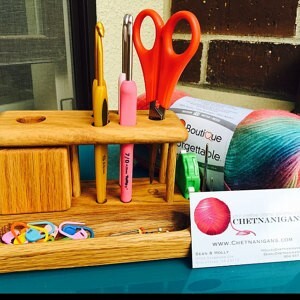 Wonderful hook holder just arrived from Chetnanigans. Perfect! Precisely what I wanted. Great service and arrived beautifully packaged with added scissors, needle, stitch ripper, tape measure and stitch markers which I hadn’t realised. Thank you! 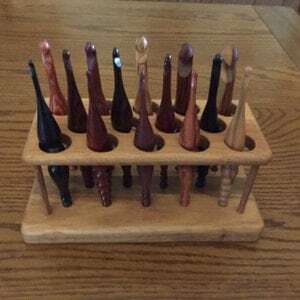 I was looking to make something like this for my wife’s crochet hook collection. This is a much better design than I could have come up with, is well made & finished. Wife loves it. 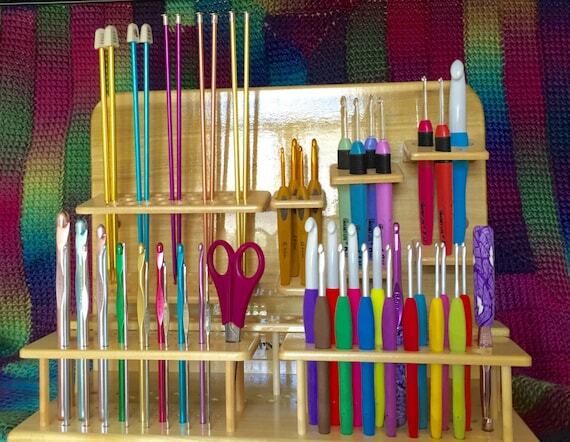 Now, what do you have for knitting needles? I am so pleased with this! I thought the bars were going to be the screw in type, but I’m so happy that they are not. It’s perfect for the size squares I’m making. Beautiful workmanship! Everything you need at the touch of your hand. 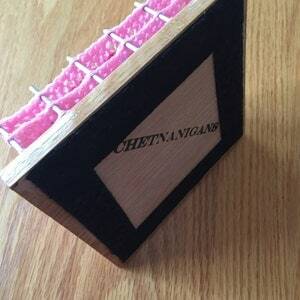 I recommend Chetnanigans to all who want to keep their tools all in one place. 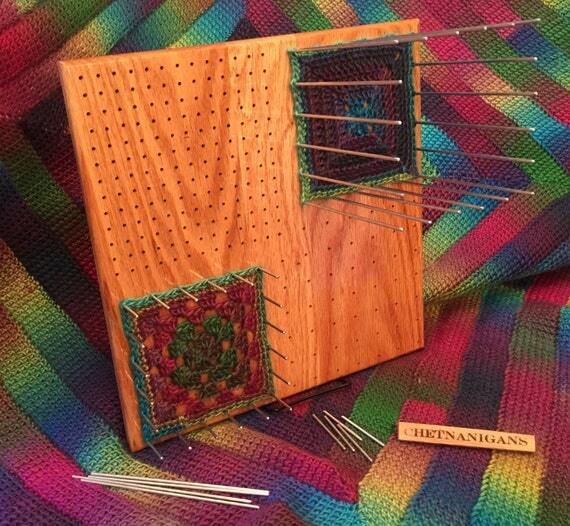 I love this hairpin lace loom. It is well made and very comfortable. Sean is extremely helpful and answered all my questions quickly. It arrived fast, especially because I’m on the other side of the country. I had a slight issue, but Sean is quick to make it right. I would definitely buy from again and tell everyone I know. Once again, awesome craftsmanship! I’m going to recommend. 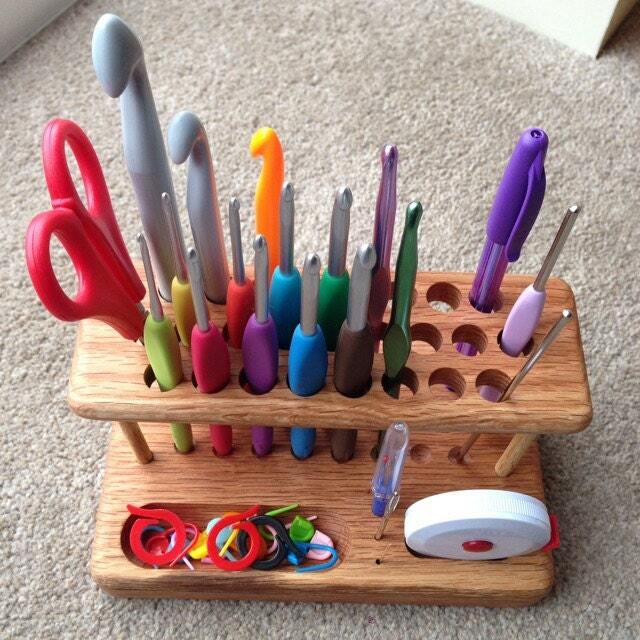 Absolutely love my new hook organizer!!! 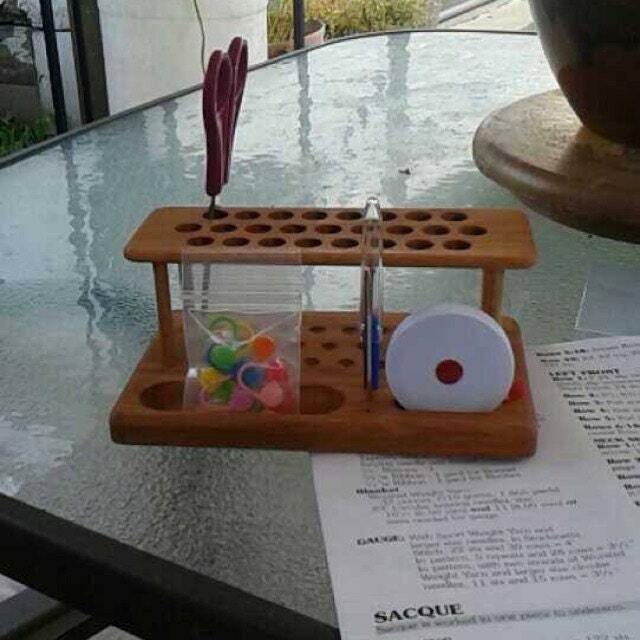 Omg the pattern holder is great. You have done a great job. You have wonderful talent. God bless. 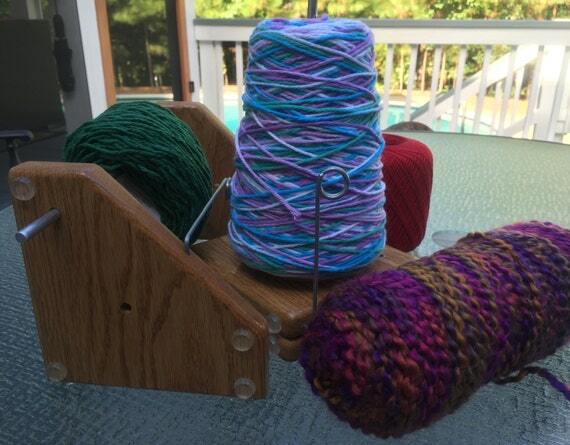 I absolutely LOVE my Furl Workstation. It’s been hard to find one that’s classy and well made. So happy I came across Chetnanigans. Now I can add to my collection of Furl hooks. Thank you Sean! 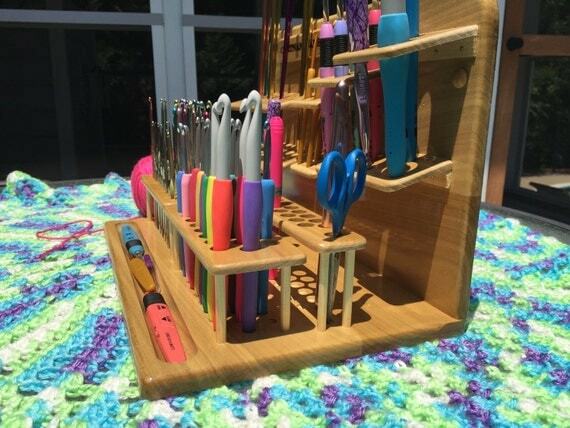 Sean is a GENIUS to create such a useful product for people who love to crochet!! Then workmanship is amazing!! Will definitely buy more items in the future!! OMG !!!!!! I am one very very HAPPY customer !!!!!! 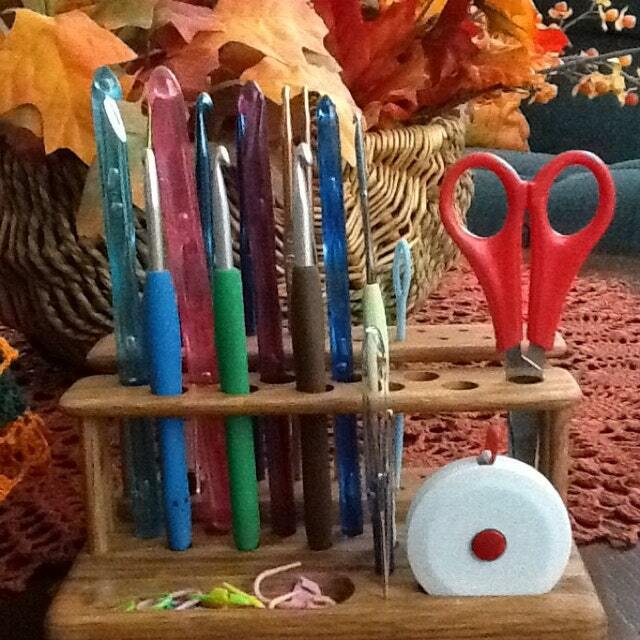 I just LOVE my new crochet hook holder !!!!!!!!!!!!! Thank you sooooo much for sharing your talent !!!!!!!!!!!!!!!!!!! As expected because of past purchases this is absolutely spot on what I was wanting! Thank you for being so accommodating. The workmanship is very impressive and I would not hesitate a minute to order again. I am looking forward to seeing what they come out with next! GREATT GREAT item !!!!! fast delivery….thanks so much for sharing your talent !!!!!!!!!!!!! I was having problems seeing patterns laying flat on my work table. Probably because I am getting old lol Now I can see my patterns and easily follow them. Very good quality! I would definitely recommend this product. Thanks so much! It was just what I needed to get my hooks organized. High quality craftsmanship! I highly recommend this product and shop! Excellent customer service! I needed one of these and I found this shop. 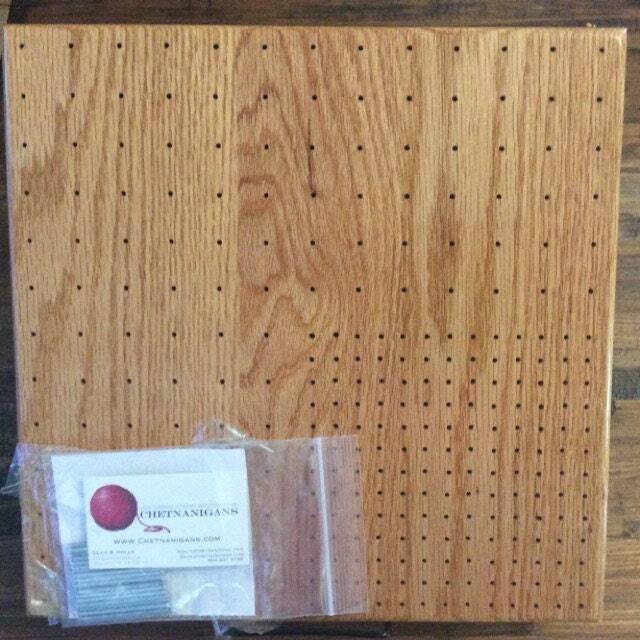 This blocking board is perfect! I’ll need to get a bigger size next! Second one I’ve purchased. Plan to buy at least one more. Well made, very convenient. 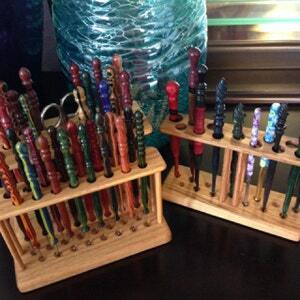 This custom stand is perfect for my Furls collection! Fantastic customer service and quality. Fast turnaround and shipping, and the quality can’t be beat! just received my order today and I am so thrilled – these hook stands are absolutely stunning (and made right to my specifications). 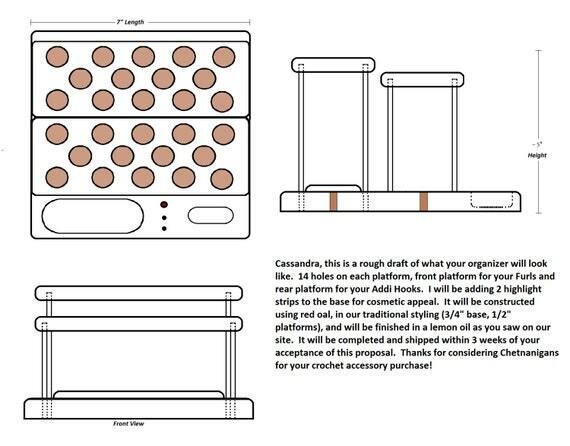 The Addi Hook stand is elegant. These are not hook stands but a work of art and will be proudly displayed by me. Wonderful craftsmanship and Sean is the best to work with on custom ideas/orders. Thanks so much!!!! Love it!!! Can’t recommend this shop enough!!! This is wonderful! Small, so it fits easily on my side table, but holds so much. I am going to order two more, one for my daughter and one for my daughter-in-law. 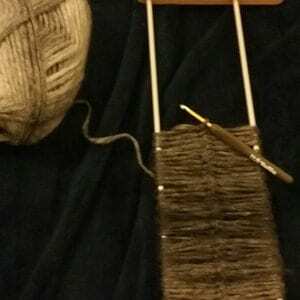 One improvement might be a place for a yarn needle and I wish he would make something similar for knitting needles — it would have to be larger, but would be sooo worth it. 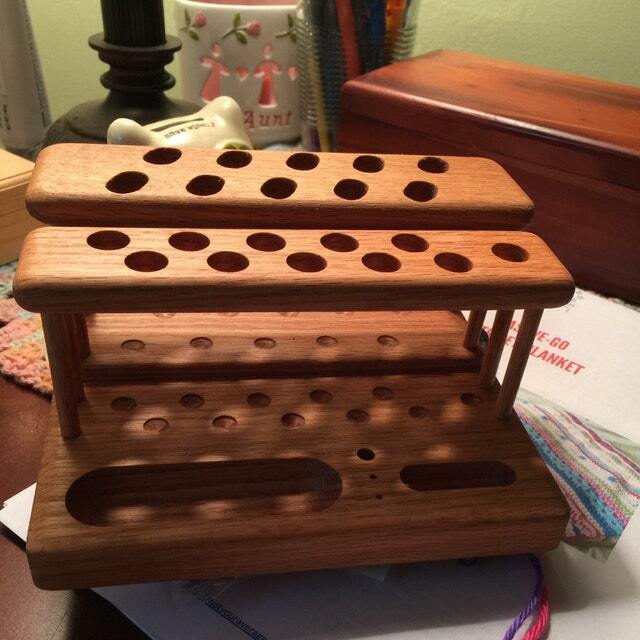 My mom was thrilled to open and receive your Furls crochet hook stand! Your service was impeccable and very much appreciated. Thank you so much for getting this to me in time for Christmas! I will be ordering from you in the future!